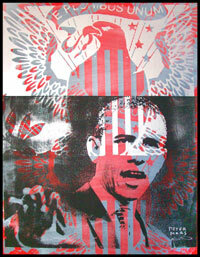 Being a Chicago-based artist and watching the Obama story first-hand, motivated me to paint about it. Seeing his motorcade in downtown Chicago is something right out of a Batman movie – a large caravan of black suvs. If you see them in traffic, you do not cut into the line. Never mind the jimmyloads of marine-types gesturing with automatic weapons, its just bad manners to cut the man off. He’s the President. You don’t need to be cutting him off in traffic. The Obamas live in Hyde Park, a beautiful part of the city on the south lakeshore. Everyone here in Chicago has an Obama story. They know Michelle’s hairdresser, they see Barack at the gym. And it’s pretty fun to watch our local TV news. Here is a typical news story: The little boy who lives across the street from the new President has his own book out in bookstores. It is a picture book full of photos and drawings that he made over the past couple years in his interactions with Mr. Obama, starting from the first day when Mr. Obama kindly introduced himself in the drive-way. And then he watches the Obama house go from just another house on the block, all the way up to having 24-hour security, concrete barricades, and special FBI agents dressed like Ninjas walking across the rooftops. 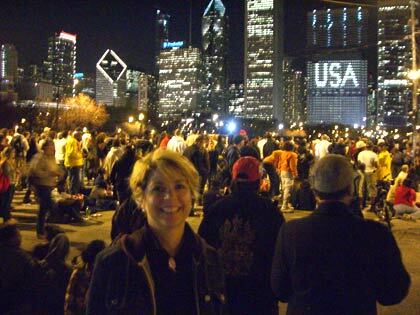 So Sandra and I can not resist going to Grant Park on election night when it was still very much unknown if Obama would even win. It is a beautiful warm evening. The crowd in Grant Park is giant. This is the exact same park where some of the wildest riots of the 1960s occurred, but now just might be a very different moment in history. When we first arrive, it feels safe, but if he loses the election, nobody knows exactly what to expect. Maybe there will be riots. Maybe not, maybe people will just go home sad and aimless. Either way, there is a lot on the line. So the mood is hopeful but at the same time, who knows? I would describe it as a strange mix of jubilance with a nervous and possibly dangerous undertow. As each state result shows on the CNN jumbotrons, the crowd cheers wildly. Or groans if the state goes Red. The racial mix of the crowd is beautiful and watching the faces of so many disenfranchised people realizing that they soon could “own” a very real piece of America, is incredible. The crowd is loud and happy. It’s very hard to hear the sound portion of the TV broadcast, and kind of like watching a show with the sound muted, and being on the show all at the same time. But finally there is a moment when the CNN screens repeatedly flash “Barack Obama declared President” and the crowd goes absolutely crazy and everyone is just dancing and jumping up and down. Some stand perfectly still and open-mouthed, looking at each other in some kind of suspended reality, unsure that something this cool could have actually happened. The vibe is intense. Okay, so he’s President. It sinks in slowly that now Obama is actually going to come out and talk and what might just as easily have been a concession speech, is now going to be a victory speech. Waiting for him to come out on stage is literally like waiting for Led Zeppelin to skip out and crank on the amps. 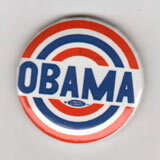 We see John McCain give a concession speech, but the crowd wants Barack. The mood is anxious and jubilant. It appears the organizers have pre-arranged some kind of soft, soothing muzac designed to keep everything calm, but the crowd isn’t having it. They chant, bounce, dance, and cry. Finally out comes the new first family. And a whole new shift happens. Its like someone turns a knob up on the crowd. They seemed loud before but now they REALLY roar to life. Barack is talking but I don’t remember hearing too much, people are just waving, jumping up and down and screaming. CNN jumbotrons flash pictures of the giant crowd filling Grant Park, beaming our image around the world. And for that one night we were the center of the universe. Over the summer I’d worked for several months on getting this portrait just right. To me, the feeling of the country for many years is much like it was during the late 1960s. A fractured nervous time, very difficult for all, no matter which side of the fence you were on. The U.S. hasn’t seen a public figure like this since JFK or MLK, and now Obama is the Man of the Hour. I felt challenged as an artist to try to capture the feeling of this time… to try to communicate in a single image what it feels like. I used Obama’s own words to title the portrait ‘Audacity’ because he is an audacious figure; representing the America we hoped we could be some day. Peter Mars painting entitled "Audacity"
1. boldness or daring, esp. with confident or arrogant disregard for personal safety, conventional thought, or other restrictions. Earlier this spring as Sandra and I were coming back from the Soho show in New York, we had to change planes in DC. We’re standing in the jet way waiting in line, and we turn around see Jesse Jackson Sr walking toward us and he takes his place in line right behind us. He beams a big smile, we introduce ourselves and clown around with him a little bit and he is very nice to us. By coincidence his son Jesse Jr is a client of The Gallery and collects the work of Mark Huddle, an extraordinary urban landscape painter. So after the portrait was finished we asked Jesse Jackson Jr if he would like to present the Obama portrait to the President. And we hope they find some nice wall space for it, because it is a project to remember.